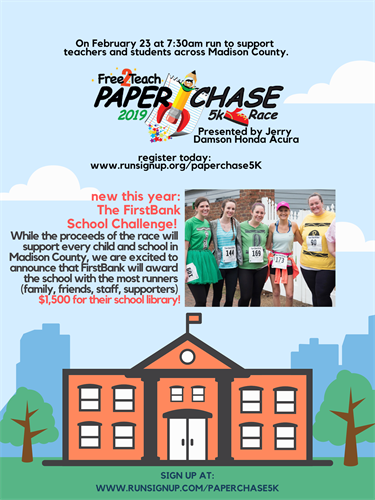 Presented by Damson Honda Acura, the proceeds of the Free 2 Teach Paper Chase 5K directly support students and teachers across Madison County’s three public school systems! New this year is the School Challenge: the school with the most runners (supporters, staff, students, families) will win $1,500 for their school library. The course winds through beautiful downtown Huntsville and is a partial loop certified with USATF (code: AL18003JE). Runners of all levels are invited as are walkers. This is a great way to run with your family and friends in a casual and fun environment. Due to insurance restrictions, strollers are not permitted on the course. You may also donate HERE.